It’s late on a July evening. About a hundred people are crowded into a botanica in the South Bronx. Shelves along the walls are filled with potions and dry herbs to cure problems ranging from kidney disease to “how to get your marriage to work.” A group of drummers leads the crowd in songs that celebrate Anaisa, the Dominican name for Santa Ana, Mary’s mother in the story of Jesus. People in the store dance, drink beer, and eat empanadas. In one corner there’s a small altar with a statue of Anaisa holding a snake around her neck. It’s surrounded by burning candles and offerings of tobacco. There’s also a statue of Buddha that greets customers at the store’s entrance. A large Star of David decorates the ceiling. “What’s interesting about botanicas is that they pick up all the elements of the religious practices by the community,” says Juan Carlos Bisonó, owner of the Botánica San Elías. Many Latinos, the uninsured as well as those with insurance, use botanicas as an alternative means to address emotional and physical health problems. “Here,” he says, “we follow the 21 Division.” It’s a religion from the Dominican Republic that includes saints not acknowledged by the Catholic Church. “When slaves were brought to America, they couldn’t follow their own religions, and they had to use the figurines of Catholic saints. But behind those deities, they adored others. For example, in the 21 Division we call [Mary’s mother] Anaisa,” says Bisonó. 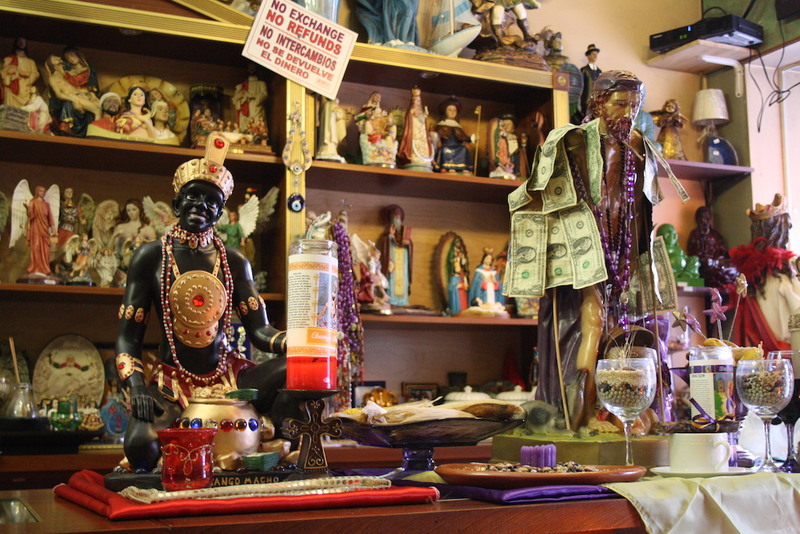 Many botanicas in the South Bronx and Washington Heights honor these saints, as well as those from Santeria, a religion followed mostly by Cubans, Puerto Ricans and Haitians. Mexican botanicas celebrate la Virgin de Guadalupe (Mexico’s patron saint), or la Santa Muerte (the goddess of death), or San Simón (venerated by many Maya people). Peruvian botanicas celebrate Santa Rosa de Lima, and Colombian botanicas celebrate Santo Niño de Atocha (a depiction of the Baby Jesus). But botanicas aren’t just about religious statues, candles, and ceremonies. New York is among the five states with the greatest number of eligible uninsured Latinos under the Affordable Care Act: around 500,000 according to the latest government statistics. Many Latinos, the uninsured as well as those with insurance, use botanicas as an alternative means to address emotional and physical health problems. 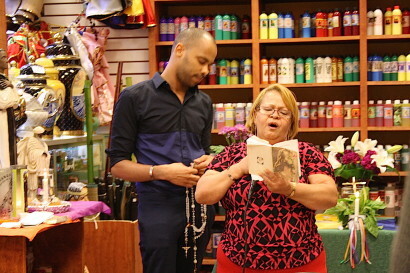 “Doctors cure diseases, but here, they cure love diseases, those diseases from your heart,” said Margarita Sanchez, a Dominican immigrant and regular customer at the botanica in the Bronx. Although there is no official count of how many botanicas exist in New York City, the number is estimated at between 250 and 300. A quick search on Google maps shows botanicas can be found in all five boroughs, although most are located in Latino neighborhoods in Queens, The Bronx, and northern Manhattan. While botanicas play an important role in many Latino communities, not everybody agrees on what their function should be. “A botanica was originally a place where you could find plants,” explains Carlos Jimenez, who runs a business importing medicinal plants from the Dominican Republic, his home country. “All these are plants that were used by our ancestors,” he says. Jimenez is a wholesaler who sells plants to botanicas in New York, New Jersey, Massachusetts, Connecticut, and California. He has all kinds of plants, like the uña de gato, ‘the cat’s nail’, used to treat cancer or for cleaning the intestines. La morringa, or ‘the liberty plant’ is used for 40 different diseases. Presidents Hugo Chávez of Venezuela and Fidel Castro of Cuba both stated publicly that they regularly took this herbal remedy. The famous Puerto Rican salsa singer Hector Lavoe sang about another plant found in botanicas called rompesaraguey. There is also the palo santo (the saint’s stick), the yerba buena (the good herb) and the arrasa con todo (raise everything), as well as more common plants such as eucalyptus, basil, rose, and orange leaves. Andrés García, a Colombian immigrant who has his own botanica in Jackson Heights, Queens, says he knows that plants can’t cure people by themselves. “This is about faith. People who believe they can get cured, many of them will actually get cured faster. It’s going to work”. In order to get an importer’s license from the U.S. Department of Agriculture, Jimenez had to learn the Latin scientific names of all of these plants. Now he knows them by heart, and the dozens of books dedicated to the science of plants he keeps in his office show his passion for the subject. Jimenez is also a Marxist economist. He quotes the phrase attributed to Karl Marx – “religion is the opium of the people.” Jimenez thinks it’s wrong for botanicas to offer spiritual and religious services. But for Irma Peguero, who owns a botanica in Washington Heights, medicinal plants and spirituality are inseparable. For example, she points out that the rompesaraguey that is supposed to help people with cancer is also recommended for those having bad luck at work. “To take away all the bad energies, the rompesaraguay is mixed with other bitter plants, like basil,” Irma explains. “Then I give my customers another mix with sweet plants, like roses”. Bitter baths used against bad energies and sweet baths to attract the good ones are very popular in botanicas. 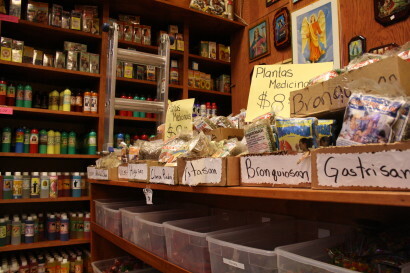 Andrés García, a Colombian immigrant who has his own botanica in Jackson Heights, Queens, says he knows that plants can’t cure people by themselves. “This is about faith. People who believe they can get cured, many of them will actually get cured faster. It’s going to work”. García has clients who have cancer, HIV, and problems with alcohol or drug abuse. He says that he becomes their friend, which also makes a difference. “The botanicas don’t only serve health, but people’s well being,” explains Ina Vandebroek, an ethnobotanist at the New York Botanical Garden who has studied botanicas for years. “They correspond well with the definition offered by the World Health Organization that defines health not only as the state where there is absence of disease, but as the state where there is complete physical, emotional and social wellbeing. And that’s what botanicas do,” she says. Vandebroek has found that botanicas in New York City carry plants recommended for thousands of conditions, most of them emotional — people who feel lonely and want to find a partner, or people who feel they have bad luck at work. In her research, Vandebroek also discovered that many women go to botanicas to cure infertility problems, even though there is very little scientific evidence to support the effectiveness of the remedies. 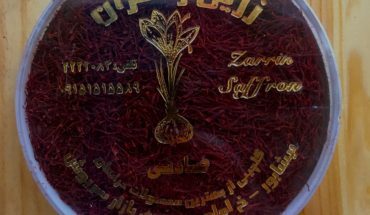 Since botanicas are considered vendors of religious articles, very few doctors or scientists take them seriously. Vandebroek has created a training workshop for doctors who are concerned about the medical treatment some of their patients find in botanicas. “I talk to them about the plants, talk to them about toxicity, use of plants, effects and cultural uses of plants. And I get positive reactions from doctors. I tell them, ‘It doesn’t matter what you and I believe. What matters is what the patient believes’,” she said. It’s clear that botanicas are an important part of the health care and emotion support systems in many Latino neighborhoods, not to mention some African and Caribbean communities as well. But outside of these communities botanicas largely remain a mystery. What’s surprising is not the stores themselves, but the fact that they go unnoticed by the thousands of New Yorkers who walk past them everyday. Fi2W is supported by the David and Katherine Moore Family Foundation, the Ralph E. Odgen Foundation, and the Nicholas B. Ottaway Foundation. Camila Osorio is a journalist from Colombia. She studied Political Science in Bogotá and an MA in Sociology at The New School. 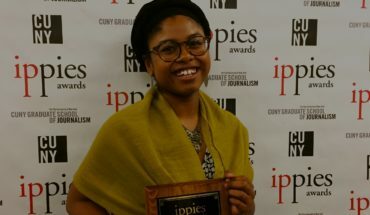 She is now a student in the Journalism and Latin American Studies program at NYU and she has done reporting in Colombia, South Africa and New York.